Time to mind your p's and q's* ! 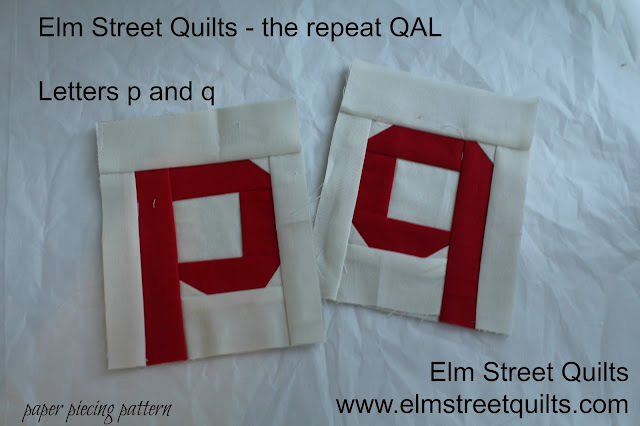 Next set of blocks in the repeat QAL are available! You'll need two (2) p's and one (1) q so just print one (1) copy of each of the paper piece pattern. The letters p & q will be trimmed to 5 1/2 x 4 1/2 '' and will be 5 x 4 '' in the finished quilt. There was a correction to the letter i pattern - make sure you check it out! I'm looking forward to minding my p's and q's this week. I'm confused! The letters look backward in the regular pattern, though the q in the small pattern looks as I'd expect. What am I missing? dezertsuz at gmail Sorry to be so dense! The paper pieced letters are fabulous! What a fun quilt!